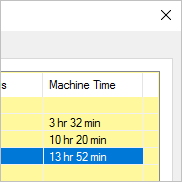 Blog / Optimize Machining Time Estimates! In any MecSoft CAM product you can get an Information report about a selected toolpath operation, a Setup or all operations in the Machining Job. This report contains some very useful information that includes the Tool #s used, the Cut Feed, the # of GOTO motions and most importantly, the estimated Machining Time. The different feed rates used during the tool motions. If the programmed toolpath contained motions with varied feed rates, as all programs will, then this has to be taken into account when computing the machining time. It is easy to see how the above mentioned formula can be extended to account for differing feed rates. In the Create/Select Tool dialog you can set the feeds and speeds you wish to be associated with the current tool. 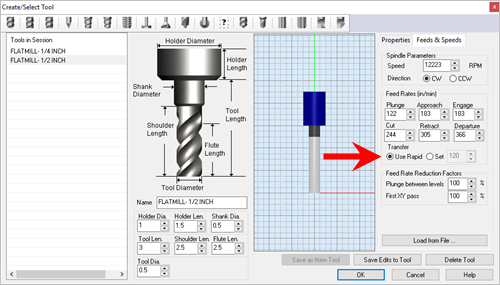 Then, when the tool is used in an operation, you can apply the feeds and speeds values from the tool or edit them specifically for that operation. On the Feeds & Speeds tab (both for the Tool and the Operation) you have an option called Transfer. Transfer motions occur when the tool must stop cutting in one location and then move to another location to begin cutting again. The speed at which the tool moves during this motion is called Transfer. There are two options to choose from (Use Rapid or Set). You can see these options in the dialogs shown below. If you have selected Use Rapid, the Transfer Feed value that is set in the Feeds & Speeds section of the CAM Preferences dialog will be used for transfer motions when you post your g-code. If you have selected Set, a field is provided for you to enter the actual feed rate you wish to use for these Transfer motions. Here we see the Create/Select Tool dialog with the Feeds & Speeds tab selected and the Transfer options indicated. Here we see the 3 Axis Horizontal Roughing operation dialog with the Feeds & Speeds tab selected and the Transfer options indicated. In order to achieve the highest degree of accuracy, select the Set option for Transfer and enter the same Rapid Feed Rate value your CNC is capable of. Do this for each of your tool definitions. 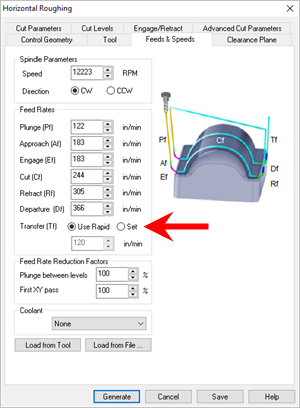 Then when you create a toolpath operation always select the Load from Tool option from the Feeds & Speeds dialog. This can done automatically by going to the Feeds & Speeds section of the CAM Preferences dialog and checking the box next to Always track Operations Feeds/Speeds to used Tool. This eliminates the CAM system from having to estimate this value, thus providing the most accurate estimation of the actual machining time on your CNC machine. On the shop floor, when the CNC machine is actually following the program, it will speed up when it sees an increased feed rate command and slow down when it sees a decreased feed rate command. These speed ups and slow downs are not instantaneous and are subject to acceleration and deceleration. This can cause the actual program run time to be longer than the Estimated Machining Time calculated by the CAM system. Also, the CNC machine can slow down when the tool suddenly encounters a large amount of material to cut. Similarly if the tool is entering an already cut area, the tool might not encounter any or very little material to cut. This can cause the CNC to speed up. These speed differences are due to the finite time it takes for the motors to react to these events. If such conditions are encountered frequently during the run of the program this can cause the Estimated Machining Time to be less accurate. The Information report is an estimate of machining time. Use the Set option to tell the CAM system what feed rate value to use for Transfer motions. Check the Feeds/Speeds values you have set for each tool. Check the Feeds/Speeds values for each operation or use the Load from Tool option. In CAM Preferences, check your default feed rate values and enable Always track Operations Feeds/Speeds to used Tool. Understand how the actual speed of your CNC machine can differ from the Estimated Machining Time calculated by the CAM system.